Forever in Our Hearts 12.08.18 - 22.03.19 It is with great sadness that Ben and Melissa announce the sudden passing of their beautiful daughter Isabelle. You will always be remembered for your cheeky smile and the happiness you brought to so many lives. Love Always, Mummy and Daddy. 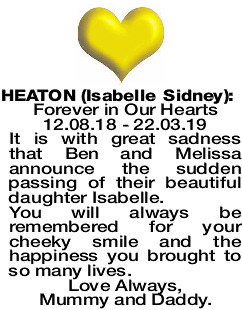 Ben and Melissa Heaton invite family and friends to attend a Celebration of Life for their dearly loved daughter Isabelle Sidney Heaton. A Cremation Service will be held in the East Chapel at PINNAROO Valley Memorial Park, Whitfords Ave, Padbury at 11:30am on FRIDAY (05.04.2019).